Followings would be a quick cheatsheet if you are DSP engineer or FPGA engineer working in LTE PHY. Let's get into further details for some of the important parameters. 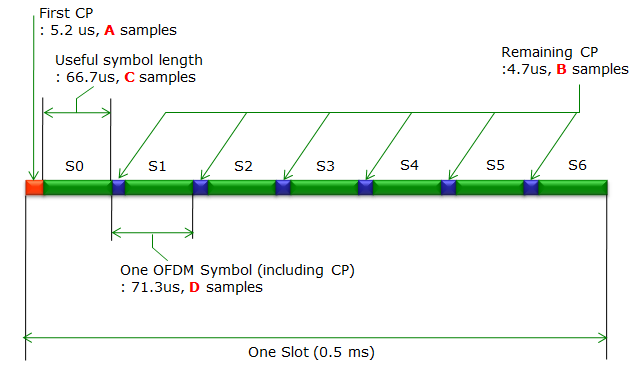 Following illustration shows the number of samples in each CP and OFDM symbols for 20Mhz case. I will calculate the number of samples for other BW case by taking the ratio of FFT site of 20 Mhz and the FFT size of other BW. In short, I will list up the value of A,B,C,D for each system BW.